The Grand Junction Off-Road Presented by U.S. Bank will be held from May 29-31, 2015 in Grand Junction Colorado. It is one of the Intermountain West and Rocky Mountain’s premier cross country mountain bike events. Featuring courses for beginners through the world’s top professionals, the rides plus music festival will have something for everyone seeking a weekend experience chuck-full of mountain bike culture. We asked Andy Suter of Epic Rides to fill us in on the event. CU: Tell us about the Grand Junction Off-Road race and event weekend. 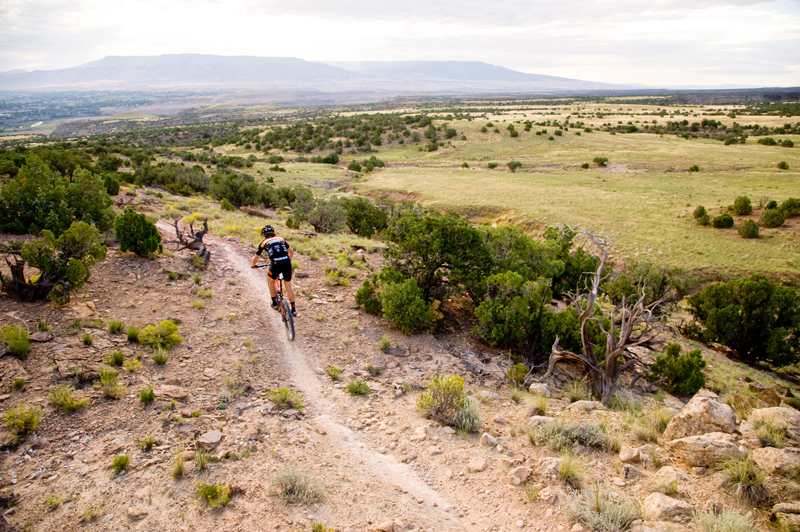 The Grand Junction Off-Road is the second event in the growing Epic Rides Off-Road Series. Like the Whiskey Off-Road, the three day weekend features a camaraderie driven mountain bike experience for the mountain bike, music loving, and fun seeking community to enjoy. CU: Tell us about the course for the different categories? How many racers are you expecting? The Grand Junction Off-Road features 15-mile, 30-mile and 40-mile courses at the beloved Lunch Loops/Tabeguache area south of town. All distances start and finish in downtown. The 15 Grand event is held Friday and shares some of the same singletrack as the longer distances. The two longer events are on Saturday and take participants into the Upper Tabeguache, including the Butterknife and Twist and Shout trails. Riders will experience a variety of landscapes and challenges, including a stretch along the Gunnison River, climbing and descending slick rock, multi-colored soils, canyons, large boulders, lunar landscapes and more. We are expecting between 500-600 riders this year between the events. CU: What are the highlights of the cross country race? CU: What other events are happening over the weekend? Is the weekend family friendly? The Shimano Youth Series Kids Ride! Offering both a 1 Grand & 4 Grand (1 Grand = 1 Mile), the 1 Grand is recommended for push bikes, trikes and newbies looking for a short ride through the expo. The 4 Grand is recommended for more experienced riders. Parents are welcome to join the children and experience the scenic ride together! Funds raised from the Kids Fun Rides are donated to the Riverfront Foundation’s family & children’s initiatives. CU: Tell us more about the Grand Junction Off-Road p/b U.S. Bank and Downtown Art + Music Festival. Epic Rides and Downtown Grand Junction have joined forces to provide what we are calling “the quintessential Western Colorado experience featuring bikes, art, music, beer and wine.” As part of its celebration of the bicycle, Epic Rides has built a reputation for throwing memorable parties, and the Grand Junction Off-Road promises to be off the charts this year with the coinciding three-day arts festival that will feature Shakey Graves, James McMurtry, and, Big Sam’s Funky Nation as the main stage’s headliners. They are three of 20 free musical concerts, and with a main stage and two side stages, there will be tunes that will appeal to all palates. CU: What is the Clunker Crit like? Who can race? Join over 100 others in the fun family community event, just getting people to get crazy and wear costumes, do laps on the pro criterium course, It’s not uncommon to see whole families dressed up as unicorns or Power Rangers during the colorful parade on bikes. A very fun gathering of the tribe! CU: What pro's will be racing and about how many? What is the prize list for the pros? We are expecting 60-75 pros this year to vie for their share of the equally split $30,000 purse. CU: Where can people stay? The Downtown Hotels, SpringHill Suites by Marriott, Fairfield Inn and Suites by Marriott, and Hampton Inn are proud to be the preferred places to recline the body and relax the soul during event weekend. With live music, and a unique offering from behind the bar, Marlo's Lounge located in the SpringHill Suites, is the perfect place to start the evening. Enjoy sipping a drink by the outdoor firepit or in the conversation round before strolling through downtown to peruse the 150+ shops or dinner.